You are here: Home » Resources » Time for some real housekeeping – Fire safety tips! Time for some real housekeeping – Fire safety tips! Fires started in and around clothes dryers are all too common. The causes of dryer fires are simple. The lint generated when drying clothes is allowed to buildup due to poor ventilation. This lint creates obstructions which builds up heat and eventually becomes sufficient enough to ignite the lint accumulated around the back of the unit (along with whatever other items that may have been dropped behind the dryer over the years). It is a relatively easy fix to prevent a fire from occurring in your dryer. At least annually, pull the dryer out and clean all lint from in and around the dryer area. Pull the vent hose and be sure that lint hasn’t accumulated in the discharge area of the dryer. Replace the vent hose if any cracks or tears are observed. To make matters worse, in some homes the vent for the dryer goes into the wall and, with only a few inches, the vent travels vertically. This type of venting provides a perfect opportunity for lint to build up causing a fire. (Many homes in the Country Oaks development have this type of venting). 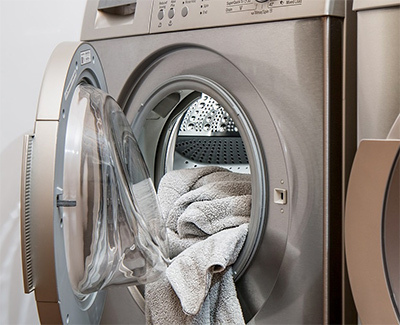 It is especially important to clean and inspect the dryer and all venting materials. Have your chimney or wood burning stove inspected and cleaned annually by a certified chimney specialist. Never restrict air supply to fireplaces. Otherwise you may cause creosote buildup that could lead to a chimney fire.